Buddies Derek Dahl and Sam Buss had the idea to create a mini beer pong game while sitting at a bar (how appropriate) with a stack of board games nearby. After prototyping at a community makerspace, their beer-loving dream is now a reality—and they’ve included flip cup in the fun, too. 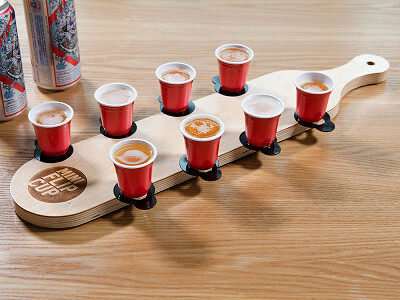 Their Deluxe Mini Beer Pong and Mini Flip Cup sets are scaled down for tabletop or countertop play. And both sets have boards crafted from locally sourced wood, too. There are catapults and tethered balls to keep things somewhat contained but still lots of fun. 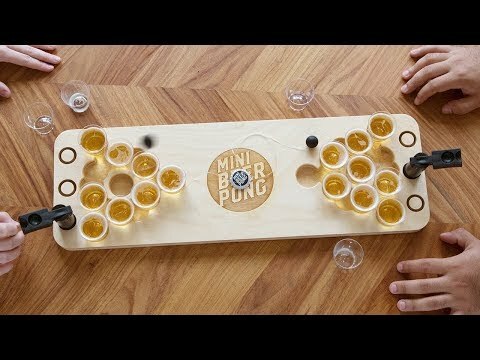 And the Travel Mini Beer Pong set has a party (and dishwasher) safe plastic board that houses the game pieces and folds down between parties. All the games have adorable little one-ounce cups, too. Now a lack of space can’t hold you back from playing your favorite party game. Hello everyone! I'm proud to introduce Mini Beer Pong to The Grommet. I'd be happy to answer any questions you have! Good morning. Do you sell replacements for the mini cups should they somehow get damaged; and, likewise for the tethered balls should the tether fray and/or break? @Tresa thanks for your question! We do carry extra cups and parts for the games. Great suggestion for the Grommet to these to their site in fact. You can likely also find them at a local liquor store or dollar store. If the tethered rips or any of the other components break or aren't working properly, just contact us and we'll gladly replace them! Any plans for custom graphics or collegiate colors? @Kory thanks for the comment and good question! We do offer custom/personalized graphics/text - currently laser engraving and very soon screen printing with full color options, just not through the Grommet at this point. Maybe we can get that feature set up through them in the future! Cheers. 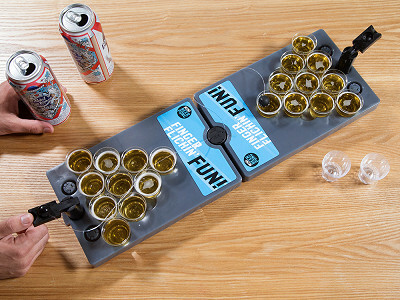 Buddies Derek Dahl and Sam Buss had the idea to create a mini beer pong game while sitting at a bar (how appropriate) with a stack of board games nearby. 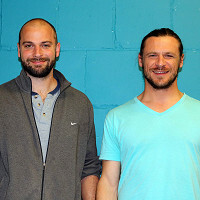 After prototyping at a community makerspace, their beer-loving dream is now a reality—and they’ve included flip cup in the fun, too. 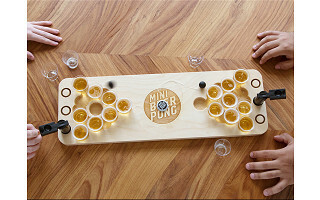 Their Deluxe Mini Beer Pong and Mini Flip Cup sets are scaled down for tabletop or countertop play. And both sets have boards crafted from locally sourced wood, too. There are catapults and tethered balls to keep things somewhat contained but still lots of fun. 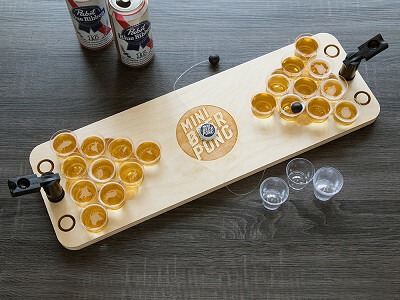 And the Travel Mini Beer Pong set has a party (and dishwasher) safe plastic board that houses the game pieces and folds down between parties. 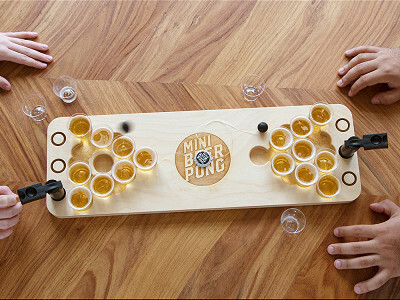 All the games have adorable little one-ounce cups, too.